There's no one line where space begins. 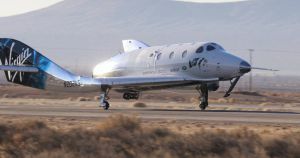 Virgin Galactic just achieved a major milestone. But did it really make it all the way to outer space? That depends on who you ask. And the requirements of getting to either point are actually staggeringly different: orbital flight requires an energy budget that’s 32 times that of suborbital flight, according to the Scientific American. More on the VSS Unity: Virgin Galactic Is Going to Space. Depending on Your Definition of Space.